Since the seventeenth century, religion has played a significant role in populating and popularizing the Jersey Shore. Although the resorts founded by religious groups are no longer limited to a single denomination, most retain some aspects of their religious heritage. The "missionaries" responsible for establishing shore retreats left behind specially designed urban plans; social life was organized around a meeting house or auditorium, and urban development occured naturally, an extension of a growing community. Although these shore resorts profited from the new railroads, they did not rely on them for a population. The result was often a homogeneous community, both in terms of residents and urban design. In contrast, the developers who planned speculative resorts were more concerned with selling their lots than producing a strong town identity or a neighborhood of like-minded residents. Both types of resorts profited from the shore's natural resources and its proximity to major cities. Whether they came to spread religion or simply brought it with them, eighteenth-century shore settlers contributed to the development of seaside resorts. Long before tourism became a business, Quakers from Burlington arrived at the shore to establish a meeting in Little Egg Harbor. The construction of a meeting house (Fig. 40) and millthe future town of Tuckertonextended the Quaker's network of meetings from South Jersey across the state. Quakers from Barnegat who built a similar meeting place in 1767 considered themselves part of the Tuckerton meeting. Early shore towns were also founded by religious groups that did not remain in the area. The first religious society in Ocean County, the Rogerine Baptists, settled Waretown in 1737. The group lived there for eleven years before returning to Morris County. According to tradition, Waretown was named after Abraham Waeir, a member of the Rogerines who remained behind, built a mill, and became a successful businessman. At least one eighteenth-century religious sect traces its origins to the shore; Murray Grove is the "birthplace of Universalism in America" and the home of the historic Potter church. Today, the Universalist and Unitarian Retreat and Conference Center, established in the early 1800s, encompasses more than 260 acres. Although not among the earliest religious denominations to reach the shore, Methodists, Presbyterians, and Baptists were the most active settlers. The tradition of camp meetings led these groups to establish permanent resort cities at scenic coastal locations. Figure 40. Quaker Meeting House. Tuckerton. Encouraged by the growth of industry and railroads after the Civil War, the Methodists responded to the growth of popular vacation cities along the Jersey Shore with their own summer retreat. The competition was intense, as "scores of camp meeting associations were established by clergymen and laymen to provide an affordable, controlled alternative (Fig. 41) to rich resorts such as Newport, Cape May, Saratoga Springs, and Long Branch, and to middleclass secular playgrounds such as Atlantic City and Coney Island." 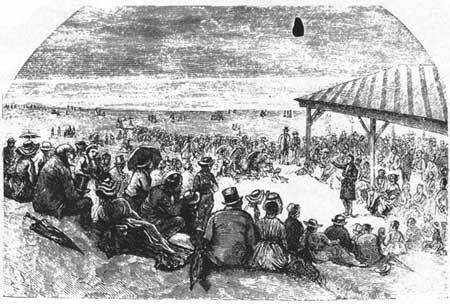 By the middle of the nineteenth century, the camp meeting had become a central part of the Methodist's religious experience; a book of regulations defined the social and architectural form of the meetings, which were becoming permanent settlements rather than ephemeral occasions. 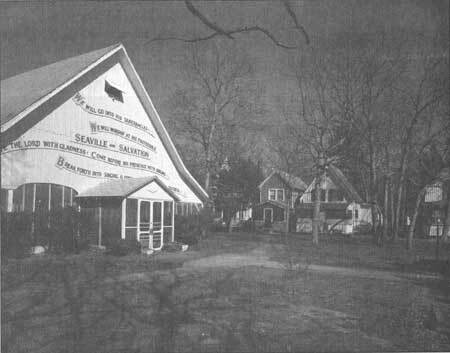 With the camp at Martha's Vineyard as a flourishing example of Methodist religious unity, those responsible for extending the ministry into New Jersey had every reason to expect success. The railroad was opening up the shore at the height of religious revivalism, and camps quickly became small cities. Figure 41. "Tent Life." Life at the Seashore, 1880. Figure 42. 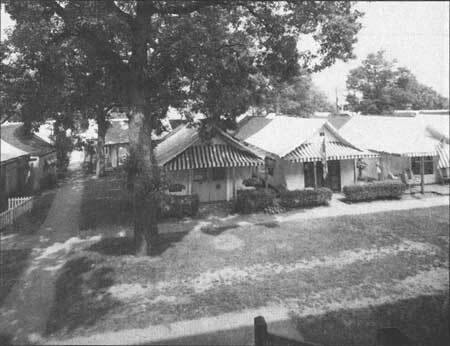 Cottages, Lamp Meeting Grounds. South Seaville. HABS No. NJ-1049-2. By 1890, the meeting required a more permanent auditorium building (Fig. 43). "The Prayer Meeting Tabernacle" was "moved in front of the pavilion and enlarged to make an auditorium 60' long and 54' wide." A huge gable roof covered both wood-frame structures, but all sides were left open. Itself a kind of canopy, the plain white front of the building is inscribed with a fanciful inscription proclaiming "Seaville and Salvation" beneath the trees. Today, a variety of original cottages remain, including several two-story, two-room balloon-frame cottages with corner pegs, as well as larger steep-roofed dwellings with Gothic windows and Victorian gingerbread detailing. Some cottages have open porches and side wings that imitate the earlier tents with their canvas flaps propped open for air. The visitor entering the South Seaville meeting today passes modern all-weather homes before approaching the older section of the camp. Equipped with electrical wiring and other modern conveniences, the Seaville meeting remains a forest retreat Methodists enjoy each season. Figure 43. Auditorium. Camp Meeting Grounds. South Seaville, HABS No. NJ-1049-A-1. Figure 44. "Services on the Beach, Ocean Grove." Harper's Monthly. 1876. 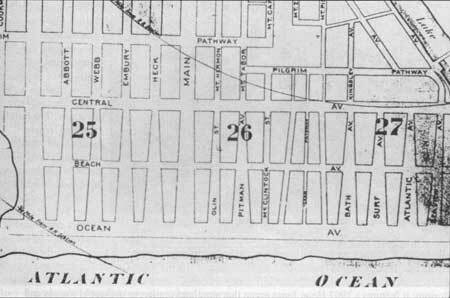 According to a recent history published by the Camp Meeting Association, the Ocean Grove meeting was originally conceived by ten families who experienced "rest and religious fellowship on the land that is now known as Founders Park." 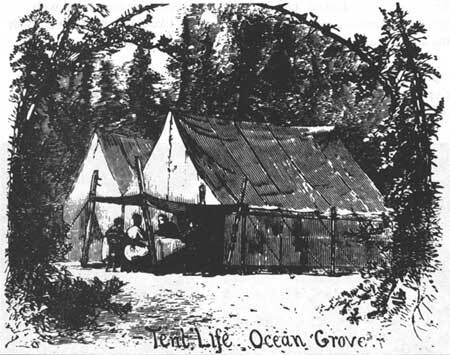 The Ocean Grove Camp Meeting Association, a group of thirteen ministers and thirteen was citizens, organized in 1869 to collectively govern the settlement. After receiving a charter from the New Jersey legislature, the association sponsored the first camp gathering during the summer of 1870. 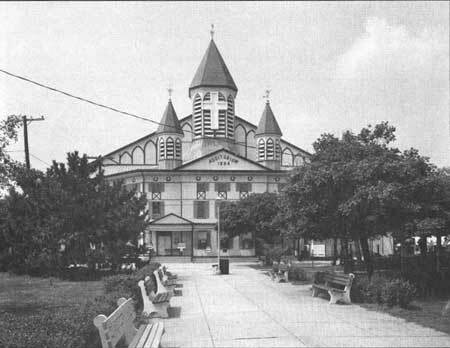 The spirit of Ocean Grove resided in its summer meetings, which were held in August for ten to fourteen days, and often drew more than 10,000 people. 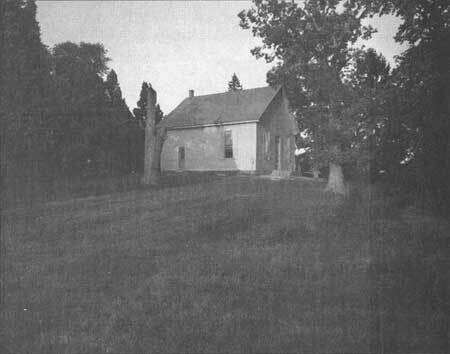 That first summer, preachers assembled in "an octagon capable of seating seventy-five ministers," while the congregation sat on plank benches under a grove of trees. The Association founders recalled the beauty of a frame structure covered with tree boughs built to shelter the congregationthe predecessor of the great auditorium. Under the leadership of the Camp Meeting Association, the town grew in accordance with a strict code of rules. Dancing, card-playing, alcohol, tobacco, and driving on Sundays were forbidden. Figure 45. Tents. Ocean Grove. HABS No. NJ-1007-9. Figure 46. Street Plan. Ocean Grove. Despite the solemn, sober demeanor suggested by the social laws regulating life in Ocean Grove, the town also displayed a playful side, particularly in its architecture. Ocean Grove buildings seem to jump from the pages of contemporary pattembooks like those of influential tastemaker Andrew Jackson Downing and later designers such as Samuel Sloan, George Everston Woodward, and A.J. Bicknell. 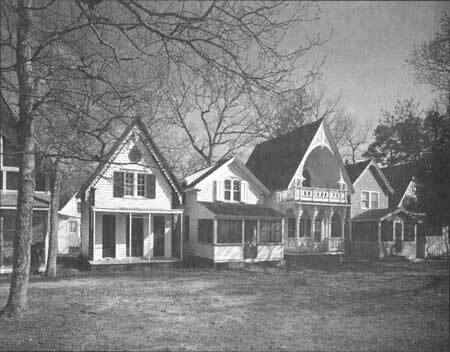 Small lots precluded full realization of Downing's ideal of romantic country villas in pastoral settings as advocated in Cottage Residences, but picturesque carpenter-Gothic and Stick-style rural cottages adapted well to Ocean Grove's narrow streets and occasional broad boulevards. Cottages had narrow facades, extensive porches, and details that not only reflected the Gothic Revival style of the time but were also appropriately church-like, with pointed windows and extensive wood scrollwork. While many buildings have been altered and such details removed, others remain largely intact, such as the row of cottages and hotels on the north side of Ocean Pathway, which leads from the Great Auditorium to the beach. Figure 47. Great Auditorium and Ocean Pathway, Ocean Grove. HABS No. NJ-1007-A-1. Figure 48. 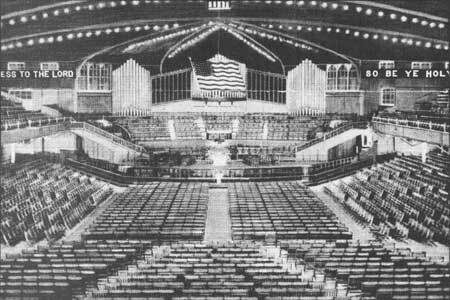 Interior of the Great Auditorium. Ocean Grove. Postcard. Ocean Grove is one of the most physically and culturally intact communities on the Jersey Shore today. The town's preservation has been assisted by the community's long tradition as a religious retreat and seasonal resort, which prevented the common patterns of investment and redevelopment that would have destroyed old buildings and patterns of living long ago. As one commentator observed in 1991, "To the outsider, Ocean Grove seems stuck in a time warp and appears not to have changed much since it was founded." Another observed, "unspoiled by mass development, Ocean Grove is a walk-in museum." Today, Ocean Grove appears more authentically Victorian than many of the seaside resorts that have been consciously restored to an earlier time.